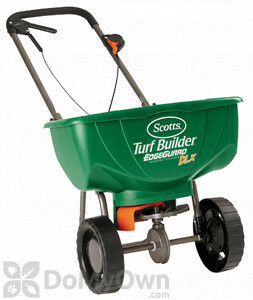 Scotts Turf Builder EdgeGuard DLX Broadcast Spreader is created with EdgeGuard Technology exclusively from Scotts. The EdgeGuard blocks off the spreader's right side in order to prevent the product from spreading on hard surfaces or non-lawn areas such as sidewalks or driveways. This has a control panel with great precision rate settings for accurate distribution and coverage. It is delivered ready-to-use, already assembled and pre-calibrated. It also comes with air-filled tires for better traction and smoother ride. Use for less waste and less clean up of products. This spreader holds up to 15,000 square feet of Scotts lawn products.